Occupation and accommodation level crossings are level crossings provided on private roads or driveways for the benefit of residents, farmers and such like. At such crossings where the minimum sighting time for trains at the rated line speed cannot be achieved, British Railways provided means of warning users of the crossing of the approach of trains. One of these means is a telephone to the controlling signalbox, or crossing box. The report on a derailment that occurred on 4th May 1982 at Nairn's accommodation level crossing in the Scottish Region of British Railways recommended a number of safety improvements. By 1991, with increased line speeds on many lines, and the Nairn's initiative, many more crossings were expected to require telephones. 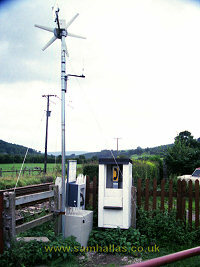 A large number of such crossings were on rural lines where there was no BR cable infrastructure to connect telephones. The line revenues were sufficiently low that the cost of cabling the lines could not be economically justified. The alternative would be closure of the crossing or even closure of the line. 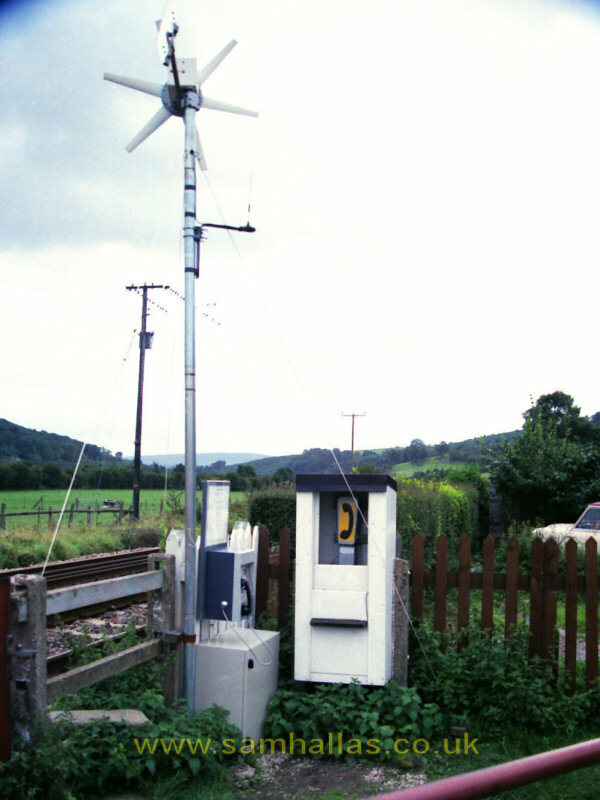 The use of fixed cellular radio telephones to provide communications at remote level crossings was considered by British Railways board Director of Signal & Telecomms to be a possible solution to the problem. Although the capital cost of the telephones was high, it was much smaller than cabling costs. Cellular network rental charges at the time were also fairly high, but BR felt that the low usage of such telephones might help in negotiating a reduction. 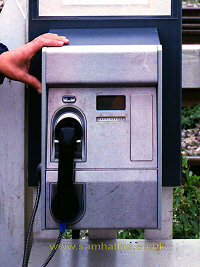 Work had already been conducted with Motorola to interface a standard telephone with the cellular network and with GPT Paytelco (supplier of the Mercury payphones in the UK) on a self-reporting payphone. Technical discussions led to a proposal for a self-testing, fixed cellular telephone, dispensing with the payment mechanism in this instance. This telephone would be capable of remote siting, powered either by long-life batteries or renewable sources - eg wind/ solar power. GPT Paytelco conducted a feasibility study, based on usage figures supplied by BR. They concluded that a telephone could be produced which would run from secondary batteries and would require visits to replace them between six and twelve months. If external wind or solar power were available, then no routine visits at all would be necessary. A field-trial trial was proposed of a single telephone sited in the compound of the Signals and Telecomms Training School at Crewe. The telephone would be programmed to make diagnostic test calls at hourly intervals, and Training staff at Crewe would make test calls at intervals to prove reliability. This was to be an accelerated life test, as actual service conditions would call for a daily diagnostic call with about four actual calls per day. The trial commenced on 27th January 1992. The results were assessed at the end of April, but the telephone was retained in service until mid May. The telephone continued to work until removed from service. The original battery was still in place and had not been recharged. A routine of between 4 and 8 calls per day took place. A very high percentage of calls were successful. The only failed calls were placed in the period 16:00 to 17:00 on weekdays. I reported at the time that this might reasonably be assumed to be caused by cellular network congestion as this is a time of high usage. The repeat calls following the unsuccessful calls were all successful, confirming my theory. Following the battery life tests, it was proposed that an actual crossing site should be selected with characteristics similar to expected future installations. Railway to be lightly used rural line. Site to be in fringe area of cellular coverage, to test the performance of directional aerials. Expected calling rate to be about four calls per day. Existing telephone to be available as fall back when test telephone out of service. Easy travelling distance from Liverpool (GPT Paytelco), Crewe (Area Engineer), and Birmingham (Project Office). 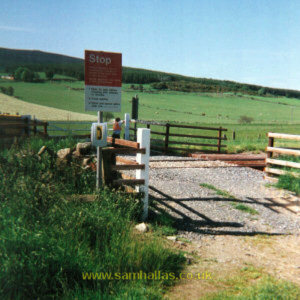 Vehicular access for regular car and vans, as opposed to tractors. An addition to the original specification was the inclusion of a wind generator to the battery supply. This would permit the telephone to operate without routine maintenance visits indefinitely in most areas of the UK with average wind speeds. 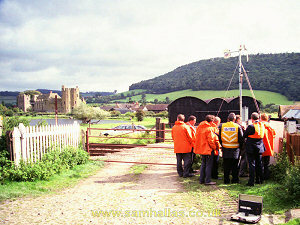 Stokesay Farm Crossing on the Craven Arms to Newport line was chosen as the site for a field trial. 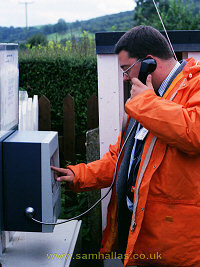 The telephone was installed on 28th May, 1992 by GPT with the assistance of the Area Signal & Telecomms Engineer, Newport. The picture above right shows the farm and crossing in 2002 taken from the tower of Stokesay Castle. There seemed to be little that had changed in the intervening 10 years. A representative from Her Majesty's Railway Inspectorate, Major King, was invited to inspect the installation along with the Operations Safety Committee at the end of July. Major King is centre with his back to us. To his right is Steve Fellerman, my boss at the time. Stokesay Castle (English Heritage) can be seen in the distance. My briefcase can be seen in the foreground. The telephone instrument was a modified version of GPT's standard payphone, of which over 100,000 had been installed in the UK alone. The telephone was fully weatherproof and would withstand temperatures between -20 and +50 Celsius. There was no need to provide an external housing unless it was needed for cosmetic purposes or for attaching signs. 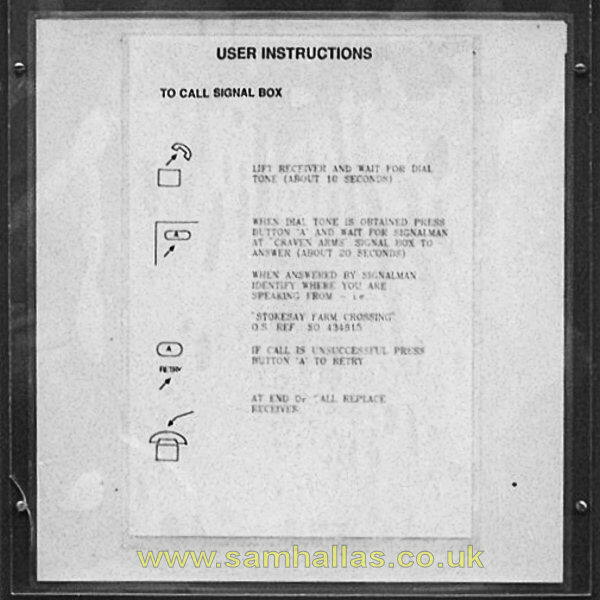 The instructions were mounted in a notice frame above the telephone. The battery ran both the radio and the telephone. The original concept was to allow the battery to run down and to replace it with a freshly charged one at 6-month intervals. 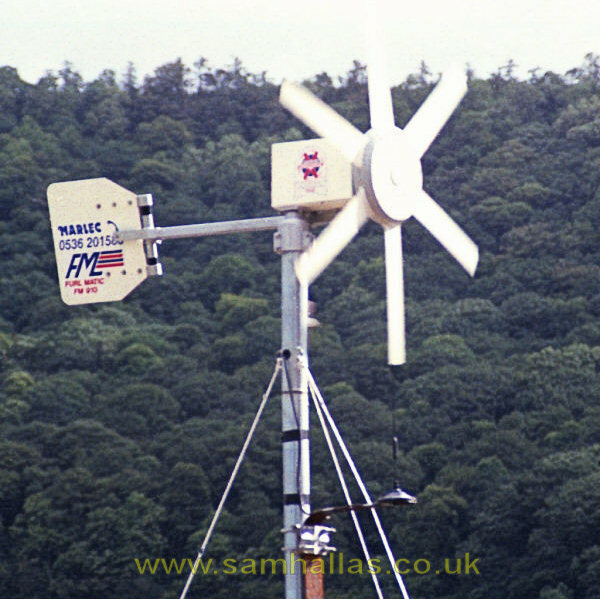 However, the field trial used a wind generator to keep the battery fully charged. The cupboard used on the trial was large enough to hold a 100 Ah battery, but was only fitted with a 12 Ah battery. Original estimates of how long the battery would last without charging proved to be unduly pessimistic. Revised forecasts would be that at the calling rate of 3 to 4 calls per day, a 100 Ah battery would run for 12 months without charging. At 20 calls per day, this would fall to something like one month. The windmill was one made by Marlec Ltd. It was the smallest in their range. Annual replacement of the slip rings is recommended. The generator might prove an attractive target for thieves although it would be sensible to include the generator in the telephone anti-tamper alarm circuitry. The radio part of the system was a Motorola car mobile cellular telephone mounted in a lockable cupboard together with the rechargeable battery. The trial aerial was a standard car whip, visible below the windmill, which could be easily broken by vandals. A more suitable alternative would have been the low profile aerial used on locomotives. The light pole with guy ropes was considered unsuitable for a permanent system. A self-supporting structure would be better. The type of pole used for station lighting was suggested which hinges down for servicing. This would avoid the need for ladders, but raised other safety issues concerned with safe lowering of the pole and windmill. Lighting poles are steel, reducing the temptation to thieves of the original aluminium pole. The site trial ran until the autumn and the findings were reviewed in November. While the trial was in progress it generated a good deal of interest from the technical press and was even visited by a TV crew from Australian television. From a technical point of view the wind generator proved to be a non-starter. The need to replace the slip rings annually and the fact that the telephone would run for a year without any charging made the turbine unnecessary. However, the principle of a fixed cellular phone to provide service in remote areas was proved to be workable. 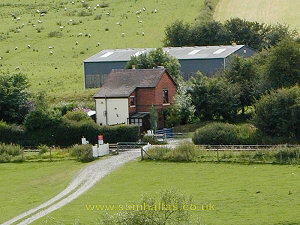 Schemes were to surface later which capitalised on the experience gained at Stokesay Farm Crossing. The trial system was an ad hoc assembly of proprietary parts and it was agreed that it needed investment to bring it to production standard. A means of packaging the various elements was needed. It was suggested that DAC (now Gai-tronics) could perform this task. The issue of who would own any intellectual property rights in the finished product was also very unclear. In the end the scheme was abandoned. All was not lost, though. Gai-tronics later developed a workable fixed cellular telephone, based on their roadside pillar model, using solar panels to keep a battery charged.